The Chillblast system attracted attention from the moment we took it out of the box, thanks to its excellent Akasa Zen case. Its white curves, rounded buttons and perspex border around the front panel give the system a stylish look, while it opens easily to give quick access to all your hardware. We noticed a slight rattle from one fan, but that was probably just an isolated problem. The best part of the Akasa Zen case is it looks vastly more expensive than it actually is, which means Chillblast still has plenty of money to spend elsewhere. 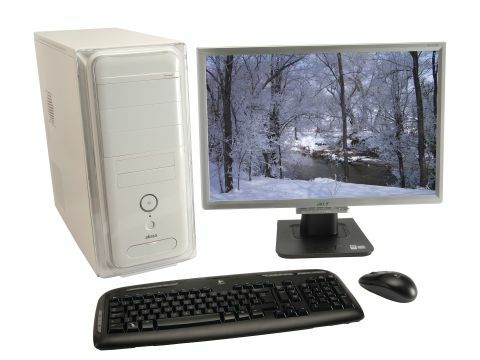 So you get a Core 2 Duo E670 CPU, 2GB of top-quality RAM, a spacious 500GB hard drive, and decent Logitech wireless keyboard and mouse set, while the eight USB and three FireWire ports deliver great expansion capabilities. The 22-inch Acer AL11216w monitor doesn't quite match the rest of the system, either in colour (silver-grey) or quality (images are sharp, but colours are average and viewing angles below par). There's also no HDCP, which means that it's not suitable for watching protected Blu-ray or HD DVD content. Of course, you're not going to get everything you might want for £799, and there's no faulting the performance elsewhere. The GeForce 8600 GTS graphics card delivered an excellent 5,773 in 3DMark 2006, 4,637 in PCMark Vantage and 7,412 MB/s of memory bandwidth, coming second in each benchmark. The 2.1 speakers are a minor let-down (although Chillblast say future PCs will come with a 5.1 set), but if you need a speedy system then the Chillblast could be worth a look.